Review of Larkin Poe albums. 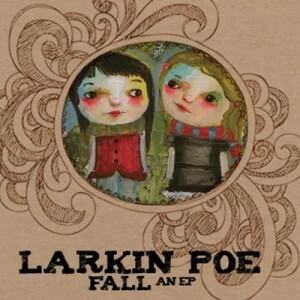 ‘Fall’ is one of two recent EP’s released by Larkin Poe, and is a sister-release to ‘Winter’. Fall contains six tracks that are taken from sources ranging from ambient rock tracks, to the alt-country groove of opener ‘Memories’ to the brooding slow bluegrass of ‘Horseshoes and Hand Grenades’. The group, led by the Lovell sisters features the Dobro and Lapsteel guitar of Megan Lovell to the fore, with support from her mandolin playing sibling Rebecca, and the usual band line up of guitar, bass and drums. ‘Just in case’ is one of those catchy rock tracks, whilst ‘Spooked’ is a love ballad of sorts, with Mandolin to the fore, and filigree piano patterns. In all this is another quality release from Larkin Poe although I do have to wonder why ‘Fall’and ‘Winter’ were released as two E.Ps, when they both add up to a very fine album of quality writing, musicianship and originality. ws a lot of promise.